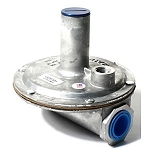 PTACSolutions.com offers a complete line of Maxitrol HVAC parts. We want to be your one-stop shop for HVAC equipment, parts, and solutions. PTAC Solutions supplies a full line of Maxitrol Products as well as other high quality Heating Ventilation and Air Conditioning parts readily available for customers nationwide. For convenience in shopping please browse the rest of our site, PTAC Solutions. Maxitrol Company’s headquarters is currently located in Southfield, Michigan with production facilities in Blissfield and Colon, Michigan. Throughout the years Maxitrol Company has undergone many changes and faced many challenges, but through the work of talented and dedicated employees, it continues to develop innovative technology for the natural gas industry. Frank Kern Jr. purchased Detroit Regulator Co. in 1946, shortly after the end of World War II. At that time the company was a small machine shop producing a line of gas pressure regulators, a model airplane engine, and servicing the local auto industry. Although Kern was initially more interested in the small gasoline airplane engine, the popularity of model airplanes declined after the war. And while the company continued to do machine works, its primary focus shifted quickly to regulator development and production. Detroit Regulator had been marketing gas pressure regulators since it was incorporated in 1930. Still almost 70 years later the company continues to produce high quality and efficient products.